Wow . . . that is the first word that comes to mind when reflecting on Part IV. Here’s the thing–it seems to me that longer books like East of Eden may not pack as much punch from page to page as shorter books because the action is more spread out, which is much of the reason why I like to try and savor longer books. This was the case with EoE for the first three parts of the book. Part IV changed that form completely. For those of you who would like to skip the spoilers, I would suggest reading my reviews on the other portions of this book. Both of the twins started annoying me in part IV. The idea of good v bad got soover the top that I felt like Steinbeck was beating me over the head with it. Despite that, I enjoyed watching them grow older and try to come into their own. Cal especially fascinated me because I felt he tried harder to overcome the ties that bound him. He felt “bad” and that was something he really had to try to overcome. It was gratifying for Adam to absolve him at the end of the novel, and although it is left to the reader to determine what Cal made of his father’s deathbead forgiveness, I believe that he was able to turn over a new leaf. Do I think Cal was responsible for Adam’s death? Or Aron’s? No, not really. We can’t control how people react to life, and although Cal knew that Aron could not handle the truth about their mother, I still did not hold him responsible for Aron’s reaction. At some point, Aron needed to grow up. Unfortunately, it never happened, but I’m not sure he ever would have. Cathy–good old Cathy. I was captivated throughout Part IV with the scenes between Kate, Joe and Ethel. I couldn’t put the book down at that point. I kept hoping Kate/Cathy would get her comeuppance and her suicide didn’t really do it for me. I was hoping for more I suppose, but I guess the fact that she couldn’t escape her demons was enough for me in the end. Overall, I loved East of Eden. Prior, I had read Of Mice and Men, another STeinbeck novel that was very enjoyable, and I can see now why Steinbeck is so revered. His themes are classic and his books are very readable. I bought this book although it was so long ago, I can’t remember where I bought it from! 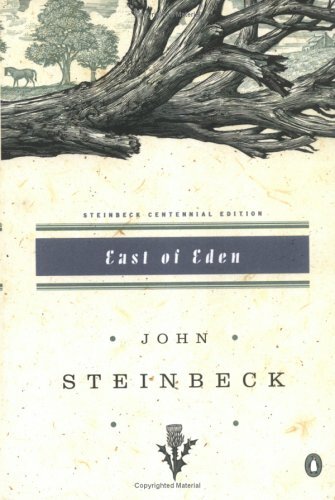 Discussion of Part III of East of Eden begins today at the Classic Reads Book Club. I don’t feel as if I was as invested in Part III as I was with the first two portions of East of Eden. It seemed like the story started to just plod along without holding my interest as much. Part of it is Steinbeck’s writing style. It can be so descriptive at times, especially regarding nature and the elements. That’s really not my thing. Plus Part III was just over 100 pages, so it didn’t seem as if there was as much time to develop the story as in the previous parts. That being said I was still captivated by East of Eden and I am excited to read the last part to see how it all turns out. In Part III the reader is able to see the twins begin to grow up and evolve into their own characters. I found it interesting that Aron is very similar to Adam, whereas Caleb seems to embody his mother’s characteristics. The difference between Caleb and Cathy/Kate is that Caleb, even though he is only eleven, understands that his way of thinking is skewed and he’s trying desperately to fix it, whereas when Adam visits Cathy after learning of Charles’ death, she still is unable to break free of her evil mindset. I also enjoyed reading more about Samuel and his family. Tom especially seems like such a deeply involved character, even more so after what happened at the end of Part III. It remains unclear to me what role the rest of the Hamilton family will play in the end of the novel. I look forward to finishing East of Eden. The characters seem to be making great strides towards self-discovery (with the exception of Cathy). It is nice to see that Adam has finally come to his senses and seems to realistically perceive his previous relationship with Cathy and what kind of person she is compared to who he wanted her to be. I hope everyone else is enjoying East of Eden as much as I am. It definitely qualifies as a chunkster, but it is more than worth the patience t sometimes takes to make it through a longer book. As I mentioned before when I reviewed section 1 two weeks ago, I plan on reviewing the book in quarters, as that is how the book is divided up for discussion over on the Classic Reads Book Blog. A quick aside on that method of reviewing—I have had a lot of people ask me how I manage to read such as great book in chunks as opposed to straight through. As far back as I can remember, this is the first time I have gone about reading a book in this manner, so I was quite skeptical too. You see, I am always hesitant about picking up long books. As some of you may know, Anna Karenina has been my nemesis for years for that very reason (although I hope to tackle it in 2010). Especially now that I have a book blog, I feel like I don’t have the luxury of reading such a long book straight through and, therefore, having less reviews for a few weeks. But when I heard the Classic Reads Book Club was featuring East of Eden, I decided to go for it. And I thought I might as well break it up into quarters and see how it worked for me. Obviously it’s not ideal, but for someone like me, who can get fidgety if it takes me over a week to read one book, I think it’s a good solution. I plan on trying it again with the aforementioned Anna Karenina! But anyway, back to the reason we’re here—part II of East of Eden. Because I am dividing the book up into sections, the reviews will be more detailed and, therefore, may contain spoilers. Here’s a quick synopsis: We left off with Cathy recovering and finding her way into Charles’ arms. Part II then begins with Adam and Cathy moving to the Salinas Valley in California . Cathy discovers she is pregnant (turns out with twins!) and she immediately tries to remedy the situation by aborting the fetus with a knitting needle. Adam, meanwhile, is beside himself with happiness and is stopping at nothing to buy and fix up an old estate to pass down to his heirs. He is, unbelievably, head over heels with Cathy, who really does nothing to advance his admiration; in fact, the neighbors find themselves suspicious of Cathy straight off, although they can’t quite put a finger on the problem. So the babies are born, and what does Cathy do? She up and leaves Adam, but not before shooting him in the shoulder first. Cathy flees, and although the police sergeant quickly discovers her whereabouts, she pretty much disappears for good as far as Adam is concerned. So what does Adam do without his wife? He becomes a hot (moping!) mess. He lets his home fall into disrepair and goes for over a year without naming his two sons. To the point that pretty much any reader would want to step through the page and slap some sense into him. Meanwhile, Cathy has gone back to her old profession—whoring. She finds a whore house outside of town and immediately becomes the favorite. The madam, Faye, begins to see Cathy as her own daughter and eventually wills her fortune to Cathy. Knowing Cathy, you are likely able to see where this is going . . . she begins to subtly try to off Faye, and is eventually successful. Section II ends with Cathy mourning Faye’s death and Adam naming his sons Caleb and Aaron. As far as Adam goes, he finally seems to be over his grief and starting anew. He had refused to see Cathy for who she really was during their marriage, instead preferring to see her with rose colored glasses. I think the shock of having that image shattered was too much for him to bear for a time, but he had finally rounded the corner and seemed like he was in a better place. Cathy is same old Cathy. Last time I said that I liked her character the most and that has not changed at all. It is not due to the fact that I am a masochistic, homicidal maniac, but rather because I find her the most fascinating character. For awhile there I was fooled for a bit, thinking maybe she had changed once she got to the whorehouse. The manner in which she treated Adam was reprehensible, and I figured her sweet behavior to the girls in the whorehouse was a guise, but I thought I saw a glimmer of change when it came to her relationship with Faye. Instead, it eventually became clear that Cathy is such a great con woman that even to me, who already knew her past and how she behaves, that I believed she had made some type of transformation. I am now past the point of believing that Cathy can ever change. Is she inherently evil? I’m not sure I know enough at this point to make a judgment call on that one, but I look forward to the second half of the book, because I’m hoping that will become clearer the more I read. So how did you feel about Cathy? Did you find her fascinating or just downright evil? Check back here on February 22 for my thoughts on part III. Generally, I would refrain from posting about a book when I haven’t finished it. However, since The Classics Read Book Club divides books quarterly, I am going to do the same and just post a review with each section/discussion. East of Eden is the perfect book to spread out over a period of time because it is LONG. If you’re a regular reader of my blog, you may know by now that I am intimidated by longer books. It is that reason alone that I have yet to tackle Anna Karenina. Likewise, if East of Eden hadn’t been chosen for the book club, it likely would have languished on my shelves for a few years longer. It’s unfortunate, because EoE so far is quite an engaging read! So far, the text isn’t very cohesive. It’s one of those books that, as you’re reading, you can’t quite piece together. The hope is that it will all start to make sense, but it’s impossible to tell when that will occur. First you’ve got Samuel and Liza Hamilton settling in the Salinas valley with their nine children. Then you have Adam Trask and his brother Charles. We are given a glimpse into their life growing up. Finally, we have Cathy Ames, my favorite character so far. She seems to have no redeeming qualities, but her story is so interesting and engaging that I looked forward to the sections about her the most. At this point, little is known about what is driving Cathy as a character. She makes some really destructible choices that are equally shocking. I kept reading on in the hopes that I could get a picture of why she behaves the way she does. The end of section 1 leaves a lot of questions. Cathy had been beaten severely after manipulating Mr Edwards, who runs a prositution ring. She crawls to Adam and Charles’ doorway, half dead, and is rescued by them. Charles is immediately suspicious of Cathy’s nature, whereas Adam is completely enamored by her. Adam ends up marrying Cathy, however she continues to use her manipulations, as she had with Mr Edwards, and instead secretly turns to Charles. So now I have to know what is going on! I put down EoE after section 1 ended so that I could discuss the first section without having my perceptions colored by reading on in the book. I’ll probably start on section 2 next week. Are you reading EoE for the book club? If so, what are your thoughts so far? It’s barely 4:30PM here and I am ashamed to admit I am already in my PJs. The plan is to spend the rest of the evening/night reading. What am I reading, you may ask. The Book of Fires, by Jane Borodale. Out this month, it is the captivating story of a “ruined” girl who flees her home and finds sanctuary as the apprentice to a fireworks maker. I have about a hundred pages left and I hope to finish the book tonight. Look for my review this Wednesday, along with a giveaway! As for tomorrow, keep an eye out for my post on the first portion of East of Eden, by John Steinbeck. Tomorrow kicks off the discussion with the Classic Reads Book Club. If you haven’t started it yet, no need to worry–discussion for part two doesn’t begin until February 8, so there is still time to catch up. The two books after East of Eden is finished are A Tree Grows in Brooklyn and A Handmaid’s Tale, both of which are excellent–I would highly recommend both! For once I don’t have a timline of books stretched out. Once I finish The Book of Fires, I plan on reading Saving CeeCee Honeycutt, by Beth Hoffman. Once I finish that . . . who knows! The possibilities are endless!